Alcoholics Anonymous is a voluntary, worldwide fellowship of men and women from all walks of life who meet together to attain and maintain sobriety. The only requirement for membership is a desire to stop drinking. There are no dues or fees for AA membership. In Guernsey there are eleven group meetings each week. Membership is about a hundred. We are part of a worldwide fellowship of more than two million members. AA is a programme of total abstinence. We stay away from the first drink, one day at a time. Sobriety is maintained through sharing experience, strength, and hope at group meetings and through the suggested Twelve Steps for recovery from alcoholism. Anonymity is the spiritual foundation of AA. It disciplines the Fellowship to govern itself by principles rather than personalities. AA's fundamental principle of Anonymity is assurance to all AAs, especially to newcomers, that their AA membership will not be disclosed. AA was started in 1935 by a New York stockbroker and an Ohio surgeon, who had been hopeless drunks. They made the startling discovery that alcoholics can help each other when others cannot. AA in Guernsey started in 1961. 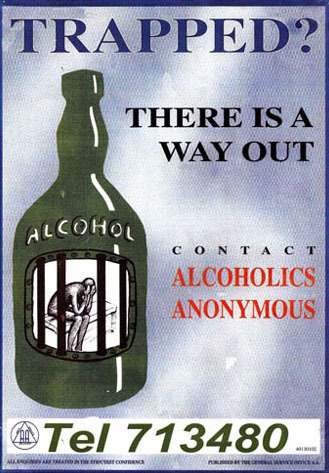 Alcoholics Anonymous offers the suffering alcoholic help in attaining and maintaining sobriety. The success rate is high, and the AA 12 step programme of recovery is used by leading treatment centres. AA in Guernsey wishes to encourage referral from health professionals and others in a position to advise the suffering alcoholic. Al-Anon, the fellowship of relatives and friends of alcoholics, is also active in Guernsey. Al-Anon Family Groups provide support to anyone whose life is, or has been, affected by someone else’s drinking, regardless of whether that person is still drinking or not. Al-Anon meets at Les Cotils Christian Centre, St Peter Port, GY1 1UU, every Monday at 8 p.m. The next Intergroup meeting is at the Oberlands Centre at 8.00 p.m. on 8 May 2019. AA has a thriving fellowship in Guernsey, with meetings every day. Many hundreds of Islanders have benefited from attendance at local AA meetings, helping them to stay sober and rebuild lives previously damaged or threatened by alcoholism. Full participation provides the key to contentment and a new freedom. AA is about one alcoholic talking to another; there are no professional counsellors. Sobriety of Guernsey AA members ranges from one day to more than thirty years. Newcomers will benefit from sharing experience, strength and hope with others with the same problem. A warm welcome awaits newcomers and visitors to Guernsey meetings. While there is not currently a Narcotics Anonymous meeting in Guernsey, NAs are welcome to attend AA group meetings.